California Jury Instructions – Civil is authored using the precise language of the law. 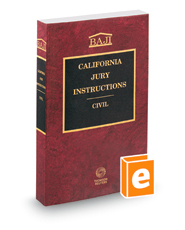 Book of Approved Jury Instructions (BAJI) has been recognized for more than 50 years as the source for civil jury instructions in California. The instructions have been tested in court, and judges and lawyers are familiar with them.